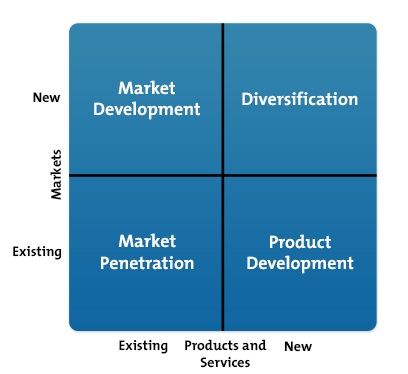 A very well-known marketing tool, first published in 1957 in Harvard Business Review, the Ansoff Product/Market Growth Matrix is used by marketers to create market growth strategies for their products. These strategies can apply both for new or existing products, and in new or existing markets, which results in four combinations. The first stage is market penetration which represents a growth strategy focused on selling existing products in existing markets. This is the least risky growth strategy as it focuses on the existing resources and skills of the company and its objectives refer to the maintenance or growth of market share, driving away competitors and increasing the loyalty of existing customers. Market development includes expansion to other market segments. New markets could mean new geographic segments, new demographic segments or new institutional segments, or it could be new sales channels. Product development involves introducing new products into existing markets. This strategy implies the development of new products or modification of existing ones and is usually a response to the needs of the market. A diversification strategy is when new products are launched into new markets. Compared to the first three strategies that implied using the company’s existing resources and experience, diversification requires a company to achieve new skills and techniques so presents the highest degree of risk. Market penetration can help companies explore their productivity and discover new means of growth. If there are no other avenues to further growth or the market is saturated, they can use market development, which is less risky than product development. Diversification should be considered the last solution due to its higher risk. The video also provides strategic planning exercises (gap analysis) for revenue and profit which analyze the gap between the objectives and forecasts of the organization. We must pay attention to productivity, market penetration, market development and product development and consider them in terms of revenue and profit to see how much the company could grow if these are increased. If the gap still persists then a final solution would be diversification. This creates a marketing planning process in four phases: goal setting, situation review, strategy formulation and resource allocation. The next column comprises the output process which is the plan itself and next to it we have diagnostic marketing and financial tools which are used to elaborate the output. This creates a clearer and more sophisticated view of which strategies are most appropriate and their associated level of risk.